Mohammed Salaimeh named as terrorist behind Border Patrol HQ attack ten days ago, as grisly details of attack made public. 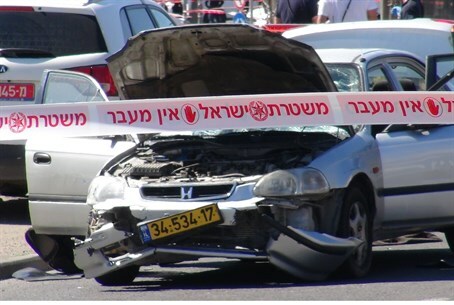 A gag order was lifted on Monday regarding the details of Mohammed Salaimeh, a 22-year-old Arab resident of the Ras al-Amud neighborhood of Jerusalem, who is the terrorist behind the car terror attack on female Border Patrol officers in Jerusalem ten days ago. On March 6 at 9:50 a.m., Salaimeh drove in his car on Highway 1 in Jerusalem heading southwards, according to the indictment list. When he arrived at the Border Patrol headquarters in the Shimon Hatzadik neighborhood, he saw the officers standing in a crosswalk, at which point he backed up, slammed on the gas and ran over the officers together with a bicyclist. A Border Patrol officer who was manning the base's entrance at the time of the attack together with another security guard saw the attack and opened fire at Salaimeh, damaging his car and bringing it to a halt. Salaimeh then exited the vehicle while holding an axe in his hand, at which point the officer and security guard again fired at him, wounding the terrorist. A total of six Border Patrol officers were wounded at different levels of severity due to the attack, along with the bicyclist who happened to be on the scene. Under investigation the terrorist admitted to conducting the attack, adding that during the week prior to it he was planning an attack against Jews, and went to the Old City where he bought an axe which he stored in his car. A day before the attack Salaimeh finalized his intentions to attack, and at 8 a.m. on the morning of the attack he left his house, driving around looking for Jewish victims. First Salaimeh drove on Highway 1, from which he transferred to Begin Highway before returning to Highway 1. When he arrived at the base, he saw the officers and decided to attack them. On Monday morning Salaimeh's detainment was extended, after the prosecutor clarified she intends to submit an indictment against him.